An allergen in your product or processing area could prove tragic to company and consumer. These plant procedures can help keep your products true to their ingredient statements. An estimated 11 million Americans of all races, ages and nationalities suffer food allergies. Symptoms vary dramatically from slight discomfort and rash to serious swelling of the skin and in the throat. Worst case scenarios include hospitalization and even death. That spells trouble for food makers, and few segments of the industry are immune. Milk and eggs, two of the "Big Eight" allergens. Photo courtesy of learn-about-allergies.com. One of the biggest food stories this year is the mandated warning statements for foods containing certain allergens. The Food Allergen Labeling and Consumer Protection Act, which went into effect in January, requires food processors to label clearly products containing eight categories of food allergens: milk, eggs, fish, crustacean shellfish, tree nuts, peanuts, wheat and soybeans. The Big Eight are blamed for up to 90 percent of reported allergic reactions to food in the country. 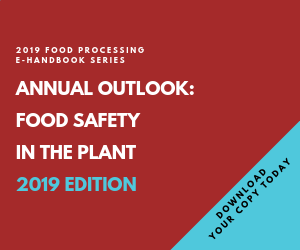 "Any product that includes any of these or any exposure to these foods has to be indicated on the label," explains Daniel Best, president of Best Vantage Inc. (www.bestvantageinc.com), Northbrook, Ill., which performs product development and market consulting for food processors. "Including a warning statement on any product is never good for business, even if that warning is aimed at only a small segment of consumers. This is a blow to a lot of ingredient suppliers, too, particularly if the processor can substitute an alternative ingredient." Fish oils are a case in point. With well-established heart-health benefits, Omega-3 fish oils have become popular ingredients. Now, however, products containing them must display an allergen warning. Some processors would rather look for plant-derived sources of Omega-3s (such as algae) than place a warning label on their products. Food marketers are willing to bite the bullet and label products according to law. But unexpected allergens that inadvertently get into a product or processing area pose a more complicated threat. "Manufacturing is where most of the attention needs to go," says Steve Taylor, who heads the Food Allergy Research and Resource Program at the University of Nebraska (www.farrp.org) in Lincoln. "It all boils down to the four S's: separation, segregation, scheduling and sanitation." Most major processors have stepped to the plate on the issue, Taylor says. A few even have blazed trails in allergen protection. "Some companies have done stellar jobs, even under difficult circumstances," he says. "They've even earned the right to brag a little bit." Maybe they've earned that right, but the brag is brief and often cut short by company spokespersons and legal departments. Talk has it that Kraft Foods conducts an admirable shared-equipment sanitation effort; that the quality assurance effort at General Mills has targeted allergen control; that Kellogg's allergen control team has established effective systems to verify results. Some corporate and front-line experts are eager to share what they've accomplished and learn, but allergen liability concerns make many at plants and headquarters alike skittish and tight-lipped on the issue. Clearly, the allergen issue is problematic and, with the new labeling bill altering the legal landscape, still new. But steps taken by the marquee names in the industry reflect key principles for protecting plant and product against unwanted allergens. Allergen control revolves around Taylor's four S's, beginning with segregation. Processing plants that can afford to segregate individual lines for the manufacture of products containing the eight major allergens have a distinct advantage over those that can't. Best-case scenario puts allergens in another plant altogether. That's a luxury usually left to big processors with large plants, preferably multiple plants, and many lines. Hershey, for example, reportedly runs its peanut products in one building while another facility never sees a peanut - the ingredient that seems to prompt the most violent allergic reactions. M&M Mars similarly segregates lines for products with peanuts in their formulation. "If you're big enough, you can run separate chocolate factories, but you can't insist on that for smaller companies," says Taylor. For many processors, the more realistic option may be to run products containing the allergens on a separate line. But "a lot of facilities are cozy. There aren't a lot of degrees of separation," says Taylor. "Move the line a few feet to the left and put up a heavy plastic curtain to separate." Curtain separation can be even more important during the sanitation process than during manufacturing. Product lifted from the floor or equipment surface under air pressure may splatter or be projected surprising distances. A curtain will catch such residue, usually limiting its fall and dispersal to the base of the curtain. "We created our Clean Curtains for control of overspray and bacteria during washdown cycles at food plants," says Tony Goff, President of Goff's Enterprises (www.industrialcurtains.com), Pewaukee, Wis. "While we've never specifically tested them for allergen control, it seems like a logical theory that they would work. Our ‘Clean Curtains' certainly add an additional level of separation no matter what the airborne enemy is." Heightened concern for allergen spread has complicated the work of contract manufacturers, too. "Co-packers must now segregate ingredients to guard against cross-contamination," says Best. Some have added physical barriers in their plants to guard against airborne spread or spills of a potential allergen. Receiving is another area where allergens can contaminate product and commence their march into the plant. "A lot of companies have separated areas where they receive dry milk, peanuts, etc.," says Taylor. "Again, it's about segregation." Identifying allergens at a glance helps to contain them. Processors are doing extra things to highlight their identity. Pallets containing peanuts or peanut product may be painted red or otherwise marked with a specific color. Some companies employ icons - a picture of a peanut, for example. If you must run products containing one of the Big Eight on the same lines as other products, scheduling becomes critical. "Schedule your sugar cookies first, then your peanut butter products. Run peanuts (or the allergen of concern) right before your major cleanup," advises Taylor. "In other words, you want your most allergenic items to run immediately before sanitation. You have to get the allergen off before the next product run." Douglas Machines Corp. has developed a number of parts washers - such as the Model 1536-SPW pictured above - that remove allergens, among other processing residue. Scheduling long runs of a product containing an allergen reduces the number of clean-ups, saving valuable production time and reducing risk. The ability to wet-clean a facility and its equipment generally simplifies the sanitation task. "An ice cream facility can have peanut and eggs and cream running on its lines. Dairies may use soy, nuts, eggs, but they usually have the opportunity to CIP [clean in place] the whole thing, which provides good allergen control," explains Taylor. "But a bakery or chocolate confection plant may have portions of the plant that can't be washed down." "Dry cleaning" a plant poses a bigger challenge. Air-hose blowing, though still common, poses risk of spreading allergens, and the better plant programs have ceased the practice. A peanut chunk can be propelled half way across a plant by an air-hose blast. A vacuum, on the other hand, removes it. In dry cleaning plant areas that contain one or more allergens, great care must be taken to control and contain allergen-laden dust and debris. Distributing allergens during brushing, wiping, sweeping or compressed-air cleaning can make a bad situation worse. This results in food quality and safety problems and increased sanitation costs associated with recleaning the allergen-contaminated areas. "HEPA vacuuming dry plant areas is an effective way to collect and effectively contain dust and debris during cleaning operations," says Russ Seery, North American director of sales for Nilfisk-Advance America Inc. (www.n-aa.com), Malvern, Pa., a maker of industrial vacuum cleaners. "Long used by the pharmaceutical industry to safely collect and contain dangerous pharmaceutical compounds, HEPA vacuums filter collected material down to 0.3 microns at 99.97 percent efficiency, exhausting clean air back into the plant environment. At this level of filtration, allergens 0.3 microns and larger and even some microorganisms are contained." Your allergen-control program is in place. Is it working? Are allergens still getting through the cracks? Maybe you have a very effective program but are wondering if you have committed too much time, money and manpower to the effort. The path to these answers is testing. Silliker Laboratories (www.silliker.com), Homewood, Ill., currently conducts tests for six specific allergens: milk, egg, gliadin (a component of gluten), almond, peanut and soy. More are on the way. The kits, developed by Neogen of Lansing, Mich., are targeting foods subsumed under the Big Eight. "Every three to six months, a new test kit comes out," says Sandra Zinn, laboratory director for Silliker, anticipating the coming release of a hazelnut test. She hopes that a "tree nut" kit will emerge that will simultaneously test for all tree nuts. "If a company claims its product contains no peanut, it must be able to prove it." Silliker tests both environmental and product samples. Environmental tests derive from swab or sponge samples from equipment. Results indicate the effectiveness of plant cleanup efforts. Tests may also indicate cross contamination via air, product or employee. "We're getting an interesting mix of samples," notes Zinn. "We are finding allergens in some samples when we weren't expecting them, but it isn't often." But when does abundant good practice cross the line into excess? The boundaries are still being drawn. "Some companies aren't doing enough. Some are overdoing it," assesses Taylor. Some processors are so scared of the allergy issue that they have gone to sanitation extremes. "One company is doing a six-hour cleanup when a 40-minute cleanup would do the trick. The company is doing too much of the right thing. They incur unnecessary cost." Many processors feel the allergen bill put the writing on the wall. For them, forewarned is fore-armed. "Vigilant companies have thought of just about everything," says Taylor. "But some companies still lack awareness of the issue. So, from the consumer's point of view, there is still a risk of hazardous product out on the market." Most frustrating is the advisory warnings, Taylor notes. Companies that know how to handle allergens don't use advisory warnings unnecessarily. "But a lot of companies are not sure," adds Taylor. "They put it on when the risk is small to non-existent - a case of CYA!" Now that your plant ops people are vigilant about keeping allergens out of your finished food products, how good are your ingredient suppliers? Some processors are using allergen tests to determine the reliability of their ingredients. "A lot of companies are making yeoman efforts to find out what is in products from their suppliers," says Steve Taylor, who heads the University of Nebraska's Food Allergy Research and Resource Program. The results can be very revealing. Some processors run tests following supplier surveys to determine if the information received from suppliers is reliable. "If a supplier isn't providing honest answers, he won't be a preferred supplier for long," says Taylor. Allergen testing employs the ELISA (enzyme-linked immunosorbent assay) test method, the same technology employed in immune system research and diagnosis. It is the initial screen for detection of the HIV virus. ELISA is based on principles of antibody-antibody interaction. "You do an extraction step then transfer the sample to the micro-well," explains Sandra Zinn, laboratory director for Silliker Labs. "The allergen reacts with the antibody coating the well." If the allergen is present, an "antibody sandwich" is created around the allergen. A blue color emerges, the intensity of the blue indicative of the amount of allergen present. President Bush signed into law the Food Allergen Labeling and Consumer Protection Act in August. It requires processors to identify eight allergens: milk, eggs, fish (by species), crustacean shellfish (such as crab, lobster or shrimp), tree nuts (such as almonds, pecans or walnuts), peanuts, wheat and soybeans. Highly refined oils are exempt from the labeling requirement. Section 203 requires identification of the allergens in "plain, common language" and to use the word "contains" on food labeling, using the "common or usual name" of the food ingredient. This part of the bill requires food marketers to clarify technical ingredient names - whey as a milk ingredient, for instance - to alert the consumer to the potential allergen. Section 205 requires FDA to inspect all food manufacturing, processing, packaging and storage facilities to ensure the firm is complying with practices to reduce or eliminate the cross-contact of a food with unintentional allergenic ingredients or allergenic protein residues; and to verify the proper labeling of major food allergens on foods. Section 206 requires the FDA to "define and permit the use of the term ‘gluten-free' on food labels." A final rule is expected within four years. Section 209 recommends revision of the federal Food Code "to provide guidelines for preparing allergen-free foods in food establishments, including restaurants, grocery store delicatessens and bakeries, and elementary and secondary school cafeterias."